well equipped stables within walking distance to the top training track facilities in South Australian racing. 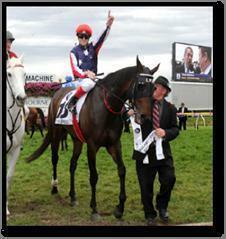 Leon Macdonald is a widely known, highly regarded and respected horseman within the Australian thoroughbred industry. He brings to the stable 45 years of successful training experience. Combine this with the energy, talent and youthfulness of partner Andrew Gluyas and we have the perfect combination to ensure continuing growth and success for the future. The win of the high quality mare Southern Speed in the prestigious Caulfield Cup of 2011 is testament to the quality of this partnership and clearly places Leon Macdonald Racing as a leading training establishment in South Australia thoroughbred racing. To celebrate our success in the 2016/7 South Australian Premiership, we have put together a highlight video with our Metropolitan winners. We hope you enjoy it!